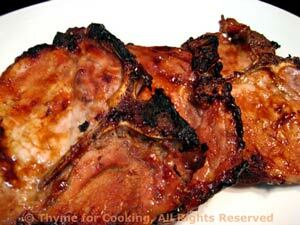 Thyme for Cooking easy summer recipes: Teriyaki Pork Chops. I try to incorporate a variety of grains into our diet. 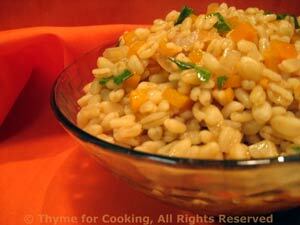 Quick-cooking barley is easy, healthy and hearty. The grains stay separate, and somewhat dry, making it great for pilafs. If you don't have any Teriyaki marinade you can use a 1:1 soy sauce / orange marmalade or juice mix. Sometimes we just have to be easy... And it's not easy to duplicate a bottled Teriyaki sauce! Pour marinade over chops. and let marinate for 10 minutes. Baste with any remaining marinade. Thinly slice the zucchini using a box slicer, mandolin, or food processor. Sauté quickly, until just starting to get soft but stop while they still retain their shape. Finish with toasted sesame seeds. Heat oils in medium, nonstick skillet over medium-high heat. Add onion, and sauté until tender. Add garlic, ginger and soy sauce and sauté briefly. Turn heat to medium, add courgette and continue to sauté for about 7 - 10 minutes, stirring occasionally with a wooden spoon, until zucchini is tender. 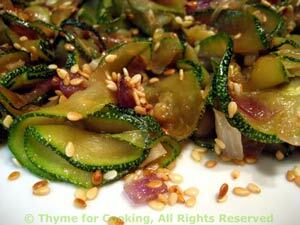 Remove, top with toasted sesame seeds and serve. Note: To toast sesame seeds put into a bare, nonstick skillet over medium heat and brown, tossing/stirring frequently. It takes 8 - 15 minutes depending on heat and size of pan.